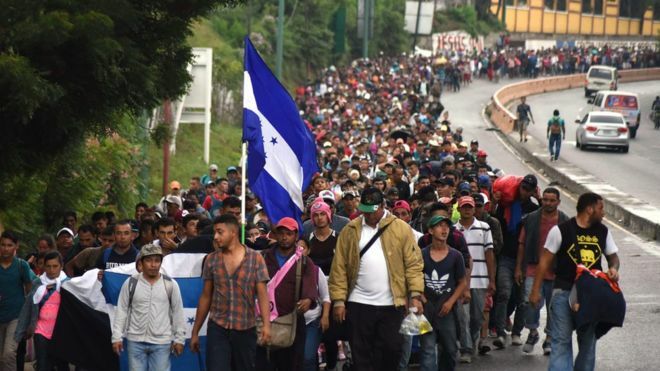 They carry their nation’s flag right up front as an invading army would march to battle. They come to take, not to enter legally, but to crash and take what they want, nothing earned; except the money Soros paid them. These, so-called brave men, that left their wives and children behind to rot in the miserable country they flee. They sprinkle a few women and children in along the way and position them where photos and video cameras can give the world a false image. You do not have to look closely to see they aren’t leaving their homeland, that wasn’t worthy of fighting for, because they are starving and unclothed. Many wear nicer shoes than I do. Evidently they were able to afford well-groomed haircuts and hairstyles you’d normally see on professional athletes. These pawns of Soros and the Democrats may end up becoming collateral damage, not exactly in the manner Nancy Pelosi had in mind. She was talking about We the People that don’t agree with this BS and all that this psycho Democratic Party have become. This is an organized invasion disguised as a refugee march. These pawns are being used as a weapon in Hillary’s, Nancy’s, Chuck’s, Eric’s, Dianne’s and the Party’s civil war. Oh and Obama! Hillary said it, “We can not be civil……… that disagree with you.”. Professional protester, works for community organizer network. Does Obama ring a bell? So now we know what Obama did, he too was a community organizer. Another words he was a paid protester; from the Left, dividing America. Dianne Feinsteins’s Soros tie to Soros, Hillary organization. SOROS IGNORED AT DAVOS: HE WAS TRUMPED!